A clean graph from Reuters showing IMF projections for 2012 and 2013. The US was the only country to get an UNCH forecast for 2012 (1.8%, which was revised downward by only 0.3% in September). Europe was the hardest hit for both 2012 and 2013, with Western Europe seen in negative territory for 2012. Germany receives a rough projection, revised down 1%for 2012, UNCH for 2013. 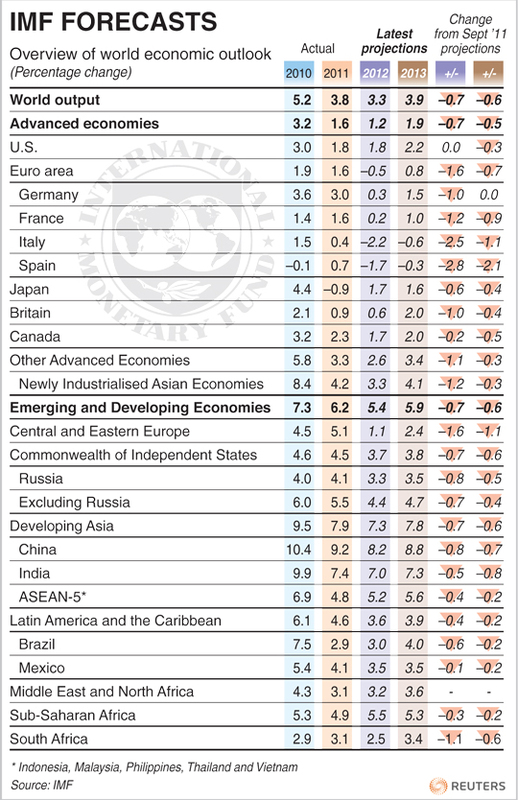 World output average seen -0.7% lower for 2012 (3.3%). Developing Asia keeps creeping lower, seeing more volatile shifts since June.